Photo taken at Laguna Seca Ranch in South Texas March 28, 2019. Nikon D7500, Sigma 180, 1/640 sec at f/8.0, ISO 1600. Don't know about macro but I thought the bud looked interesting. Found a good sigma lens for a very good price and thought I might give it a go. I appreciate your critiques, and don't worry if it's harsh. I have very thick skin. Nice colors, subject and BG. My recommendations are to use a smaller aperture for more depth of field and a bit more room around the subject at the top. A square crop would be optional. 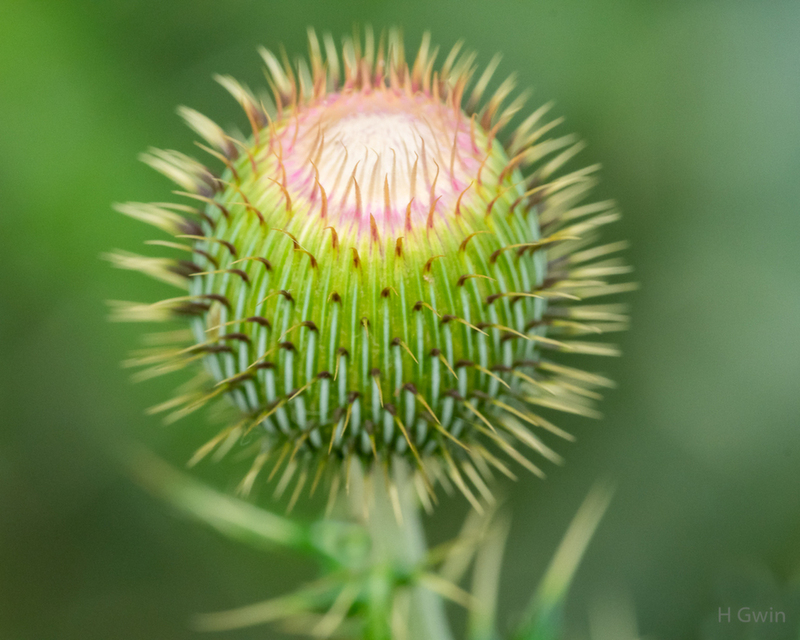 Looks more like a thistle to me, but it's a great subject, very graphical, and a fine photograph. The Sigma 180 is an excellent lens. f/11would have given you a bit more detail. I think you have chosen a photogenic subject that works well in the lighting situation present. I like the look, and your chosen aperture, although as mentioned experimenting with dof is a good idea to see what u like/dislike. Compositionally I would ideally have preferred a little more imaginative input in regards to subject placement and how this aspect relates to negative spaces and oof lines within the image. As seen its all a little static - sort of here it is and the eye is not really drawn into roaming the frame. Matthew, Agree about the composition. I struggled with the placement and really didn't come up with anything. Where would have placed the thistle? Thanks. Its difficult to say just by looking at your image - my take would probably have been to opt for a vertical format, using the full frame and incorporating a nice flowing stem with side spikes to help craft some lines - the stem need not be sharply defined for this to work; basically you are using it to add direction and leading lines into the image. So probably trying for a upper left positioning allowing the stem to flow right to left. Maybe this would not have been an option in your given situation, and would almost certainly resulted in a comp that had a smaller image size. If I opted to retain you chosen image size more or less - then I would have chosen to change line of sight angles, and crafted an image based upon the circles contained within the subject. i.e. whole flower head, pink circle and white circle; positioning the subject so the circle flow ran opposite to the overall impression of the direction of outer spikes. There's loads of compositional options - and my vision almost certainly would not spring immediately to your mind. My suggestion would be to work the subject, change angles, explore aperture and images sizes and get a feel for the lines and patterns that your eye sees. Use these to make the image. Not really sure if my waffling helps you out tbh, but its hard to explain that's its more about seeing and following your own thought process. At the end of the day it should be your vision not mine that counts, your thoughts in regards to if the image works or not. Matthew, Thank you for the inputs. If you chose to go with more DOF with a long macro like the 180, you can back away some and also choose a BG that won’t show up in the image. Sometimes a smaller f stop is not enough. Of course, a tripod is a must with macro. I hope to use the same subject and take a photo using the ideas you guys were nice enough to provide. I'm learning that macro work has much more planning and considerations than bird photography. I'll speak to the appeal of this image. I like the way the spikes radiate out and the nice color in the center. It has a nice lively look to it. I can imagine experimenting with this same subject could be really fun, as it has a lot of potential interest to my eye. I would suggest, perhaps, a bit more sharpening here. Gene, I think you've got off to a good start here, and you've had some good advice. I have the Sigma 180 macro, and love it. I like to get a single subject and then take lots of different views and depths of field to see what I prefer - at least your subject can't run or fly away, that's part of the fun of macro! - at least your subject can't run or fly away, that's part of the fun of macro! There are links to other macro topics at the bottom of that page. Yes, but Gene's subject was a flower bud, Joe, so that wouldn't be running away anytime soon. I like it except for the OOF stems at the bottom. Maybe a bit of clean up?